How the U.S. media would cover the Supreme Court nomination fight if it happened in another country. 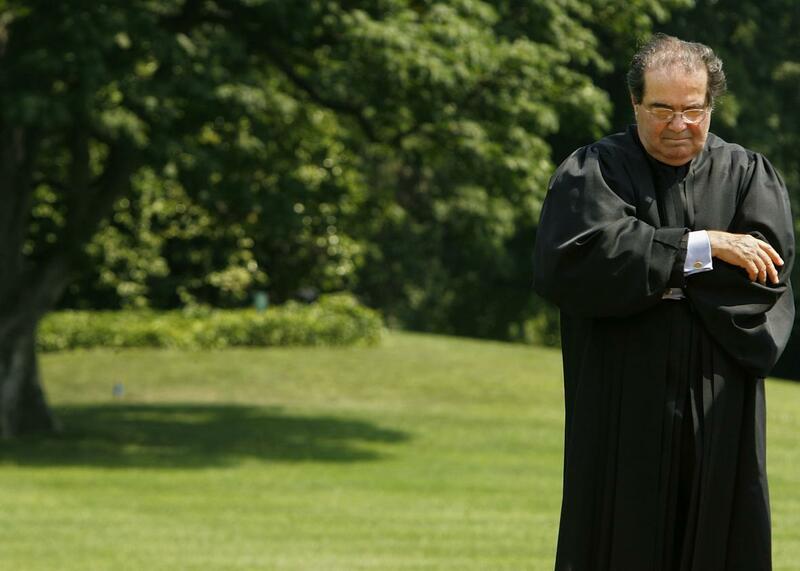 Antonin Scalia, wearing the traditional black robes of his office. WASHINGTON, United States—The unexpected death of a hard-line conservative jurist on America’s constitutional court has exposed deep fissures within the ruling regime and threatens to throw the country’s fragile political system into months of chaos. The nine unelected justices who sit for lifetime terms on the Supreme Court are tasked with ensuring that laws passed by the democratically elected government don’t violate the ancient juridical texts upon which the country’s laws are based. As such, they wield immense powers and have the ability to overrule even the president himself. The aged, scholarly jurists, cloaked in long black robes, conduct their deliberations behind closed doors, shielded from the scrutiny of the media, and their most important decisions are often released to the public with great drama but little warning. Respected by both allies and enemies, Antonin Scalia was a religious fundamentalist and fierce ideologue known for his stylish and original readings of the ancient texts. He led a movement within the court that supported adhering closely to the principles of the nation’s founding revolution, even as many laws have appeared out of step with the values of the modern world. He and his acolytes have often stood in the way of dissidents’ efforts to use the American legal system to seek increased rights for women, gays, and ethnic minorities. Hard-liners have held a narrow majority on the court until now, but Scalia’s death threatens to tip the balance of power and has set up the latest in a long-running series of confrontations between President Barack Obama and his opponents in the legislature. Obama was elected as a moderate reformer in 2008, pledging to improve America’s relations with the outside world and deliver economic growth. While he has had success in some areas, opposition from the hard-liners controlling the legislature and judiciary has often thwarted his ambitions. For instance, in December, Obama signed a historic agreement with world powers to cut America’s controversial carbon emissions, but many skeptical observers questioned whether he actually had the power to enforce the international community’s demands in the face of staunch opposition from Scalia and his fellow hard-liners on the court. Obama likely now hopes to replace Scalia with a reformist judge that will support his agenda, though even the most moderate reformer could be unacceptable to powerful hard-liners like Senate Leader Mitch McConnell. While normally a straightforward process, the naming of a new justice has been complicated this time by the country’s impending presidential election. Obama is prevented by law from seeking a third term and the hard-liners hoping to recapture the country’s executive compound are demanding that Scalia’s seat be left open until the electorate can choose a new president. Both sides of America’s traditional political divide are under more pressure than usual this time around. Any compromise by the conservatives in the legislature could benefit the surging ultra-nationalist, far-right campaign of television performer Donald Trump, considered a threat to the establishment across the political spectrum. Obama is likely hoping to hand power to his former foreign secretary Hillary Clinton, a member of the powerful Clinton clan, but radicals within his own coalition have broken off to support the far-left populist campaign of Sen. Bernie Sanders, known for his scathing attacks on the political influence of America’s ruling oligarchs. The court has abetted this influence with some controversial recent decisions, which Sanders has vowed to overturn. Outside observers hope that the crisis can be resolved soon. With a divided and short-handed court unable to issue definitive decisions, it’s possible that certain laws may be interpreted differently by lower courts in different regions of the country. Rural areas where the strictest form of political Christianity hold sway may push for restrictions on abortion and on the availability of birth control in accordance with traditional beliefs, in contrast with the coastal urban population centers where such practices are more culturally accepted. Confusingly, both sides of America’s political divide claim that they are upholding the values of the revolution. If the court continues to be unable to act as the final authority in these disputes, that will only deepen political divisions at a time when unease and violent unrest are already rampant. But American legal scholars disagree on what the ancient texts say should be done in this situation, and the confrontation is likely to drag on for some time.